is a welcoming home for your Roman holiday. From the windows you can admire the ruins of the Forum of Augustus and Trajan's Market, home of the Knights of Rhodes and the beautiful square where the famous palace of the Marchese del Grillo (see movie). The Coliseum, Palatine Hill, St. Peter in Chains, Piazza Venezia and the Vittoriano, the Spanish Steps, the Pantheon, Piazza Navona, the Capitol, the Ara Coeli, Teatro Marcello, the Mouth of Truth, Circus Maximus, Terme di Caracalla, the Tiber Island and the Quirinal and the beautiful Trevi Fountain are reachable with a pleasant walk (10 "real" minutes! ).The house, tastefully renovated and equipped with every comfort and can accommodate families and small groups of friends up to six people. To meet all his needs, guests have access to a kitchen (breakfast included in price. "product packaged from housewife pantry"), and a living room with a sofa bed, a bathroom with shower and two bedrooms.. The double bedrooms "Suite of Augustus" from the windows you can admire the square and the Forum of Augustus. Each room has air conditioning and indipendent heating, TV and wireless Internet wi-fi access. 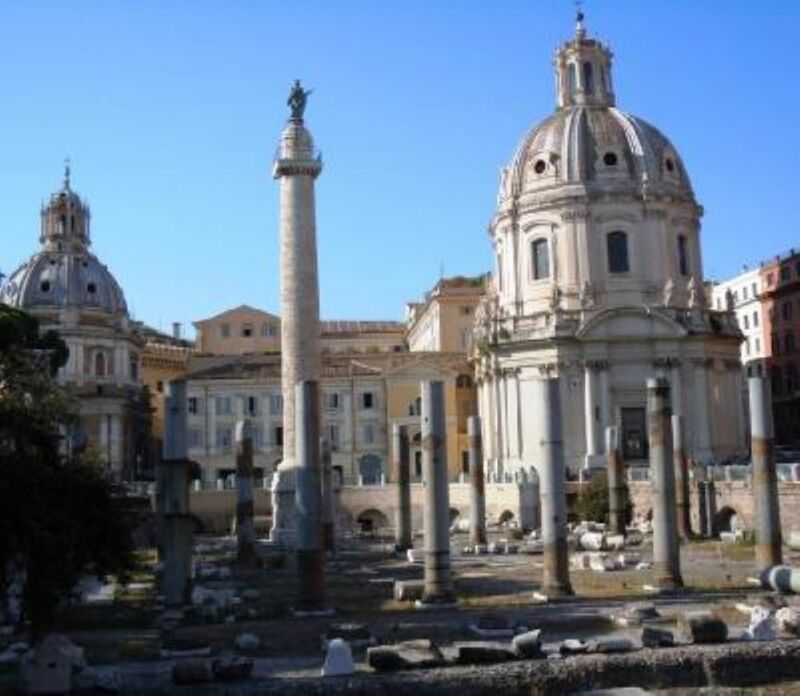 "The Cricket at the Roman Forum" is ideal Holiday for a romantic and exciting for those who love the story of "Caput Mundi Rome". Fantastic location and ammenities. Silvia was wonderful!! She was there to greet us and showed us everything we needed to know about the apartment. She left breakfast items and beverages to last through our stay. She went above and beyond to ensure we had a pleasant stay. She even helped us securing transportation. HIGHLY recommend staying here if you plan visiting Rome. This apartment is right behind the Forum and steps from the Colosseum. Silvia was so nice and very responsive. The house was spotless. It had enough room for our family of 5. We loved being in the middle of Rome. We are hoping to stay here again the next time we are in Rome. Silvia is a wonderful host! She is very helpful and responsive. Silvia helped us arrange transportation and had some basic supplies in the refrigerator when we arrived. The apartment is in a great location within walking distance to many of the main attractions. Silvia and Carmela were wonderful hosts. They provided plenty of breakfast food in the apartment, communicated really well so check-in and check-out were easy, and Sylvia even brought some clear tape when we were checking out and helped me tape a 10 Euro note back together after it got ripped in two pieces. The location can't be beat -- it's right behind the Forum in the center of Rome, and a fairly short walk to the Coliseum. Overall it was a wonderful experience staying here during our Christmas trip to Rome and we highly recommend it. Thank you Silvia for your hospitality, if we come back to Rome we will check to see if your apartment is available. A great location for exploring, and feeling a part of, the city. Silvia was a gracious and accommodating host. She responded quickly to communications and was very patient with us when our flight was delayed and we got there late. The place was clean, well stocked and in a great location. You walk out the front door and feel an immediate connection with the city. Lots nearby to do and eat. GRAZIE MILLE !!!! Incredible location; attentive, friendly, English-fluent contact; and fully equipped kitchen including breakfast fixings for the next day in case of a late arrival. We can't wait to come back! Nazionale/Quirinale stop (it is the last stop on via Nazionale - ask the bus driver), then accross the road and walk down on the first street on your left (Salita del Grillo), and you arrive. I highly recommend to book a pick-up service (35 euros). Besides the historical value of the area, the Rione Monti offers a wide range of recreational activities and fulfillment of the most refined palates thanks to the local taverns and restaurants specializing in traditional and modern cuisine. Tariffe scontate in relazione alla durata, Tariffe si intendono per 2 persone, ogni persona in più €25 a notte. Caparra richiesta alla prenotazione, Consegna delle chiavi da parte del Proprietario. tassa di soggiorno obbligatoria €3.50 a persona a notte per i primi 10 giorno di pernottamento. (non pagano i bambini minori di 10 anni).